The European HORSE project started in October, with the kick-off meeting taking place at the FZI Research Centre for Information Technology at the Karlsruhe Institute of Technology, Germany, between 19 and 20 September and had the participation of all the seven projects that were selected in this application. The researchers Rafael Arrais, Luís Rocha and Manuel Silva were representing CRIIS. The idea of FlexCoating is to incorporate safety technologies, based on 3D vision in existing industrial robotic cells, namely for the application of functional coatings in technical surfaces of variable dimensions and complexities. 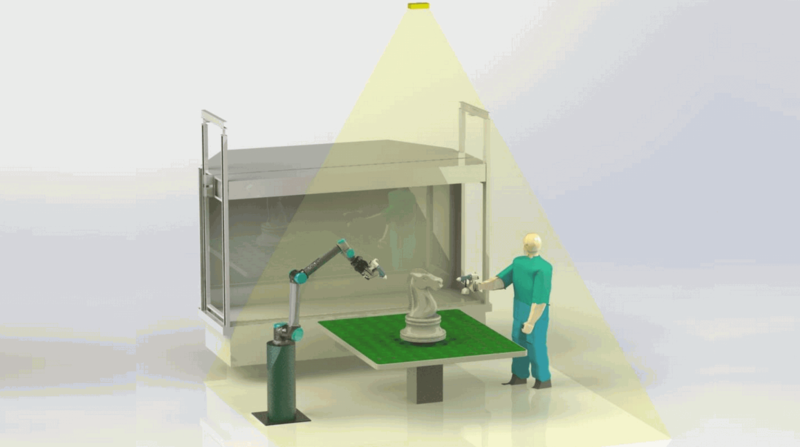 The aim is to transform an existing traditional robotic cell, that is, where the robot is protected by a cage without interacting with the operator, into a collaborative robotic cell where the robot and the operator can paint the same component simultaneously, thus contributing for an efficiency and flexibility increase in the production process. This technology has been being tested at FLUPOL, a Portuguese SME specialised in the application of functioning coatings, having collaborated successfully with INESC TEC in the SIIARI - System for the Increment of Artificial Intelligence in Industrial Robotics - project, which was completed in 2013 where a programming system by demonstration was developed and that allowed to intuitively transmit decades of experience of the highly specialised operators to robots. This system has also being operated ever since by TALUS Robotics, a spin-off of INESC TEC. These three entities have joined again and created the FlexCoating consortium, which will last for nine months and will be totally funded with 199,975.00€ under the European Union’s Horizon 2020 programme.